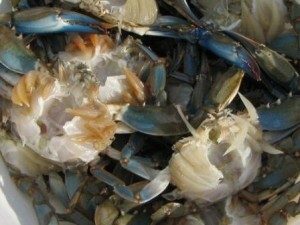 Blue crabs can be steamed either whole or with the shell removed and the bodies cleaned. 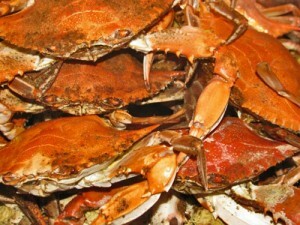 With either method, crabs are layered in the steamer, coated with seasoning, and steamed until they turn bright-orange. When steaming crabs, it is important to keep them elevated above the water level. 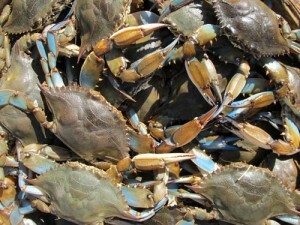 Blue crabs can be eaten right after steaming, or chilled before extracting the meat from the shell. Freshly cooked crab meat is used in crabcakes, crab soup, appetizers, or other dishes. Blue crabs after cleaning, ready to be steamed. Hot steamed blue crabs, cooked with the shell off and coated with spicy crab seasoning. 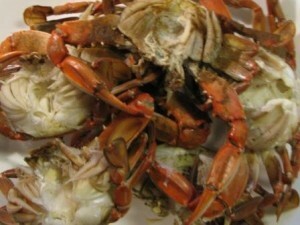 Blue crabs are sometimes boiled with spices and other seasonings. They can also be fried or grilled in the shell.